Engineered utilizing state of the art CAD CAM 3D modeling, CNC machining, computer controlled Superflow air flow testing, rotational molding, injection molding and countless man hours, these systems represent the apex of air induction technologies. Every Evolution Motorsports V-Flow Intake installs in the factory location and utilize the OEM “ram air” fresh air ducts for lower air intake temperatures and added power. 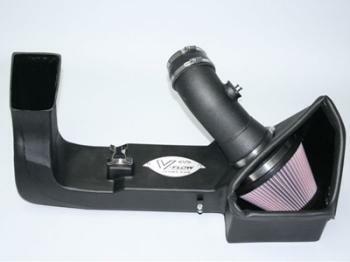 Additionally, Evolution Motorsports V-Flow Intake Systems also incorporate a custom cotton air filter and a 6” injection molded Venturi that acts as a vacuum for cold-air. All these components work together to create the most powerful Porsche air intake systems on the market today. The Evolution Motorsports V-Flow Intake is being utilized by almost every Porsche 997 participating in the Grand AM Cup GS series due to its consistent and reliable power gains. These race teams require real results and rely on the benefits of the Evolution Motorsports V-Flow Intake System for their race cars.